This part of the website is only new and there is not that much on it yet! Wikipedia says that "Rhythm guitar is the use of a guitar to provide rhythmic chordal accompaniment for a singer or other instruments in a musical ensemble. 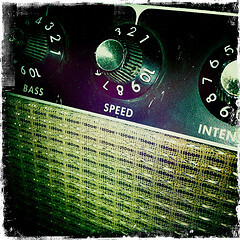 In ensembles or "bands" playing within the acoustic, country, blues, rock or metal genres (among others), a guitarist playing the rhythm part of a composition supports the melodic lines and solos played on the lead instrument or instruments, be they string, brass, wind, keyboard or even percussion instruments, or simply the human voice. In the most commercially available and consumed genres, electric guitars tend to dominate their acoustic cousins in both the recording studio and the live venue. 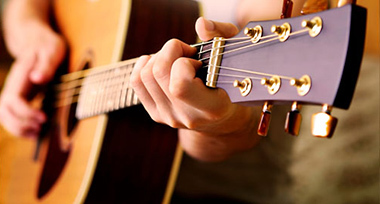 However the acoustic guitar remains a popular choice in country, western and especially bluegrass music, and is used almost exclusively in folk music." That is a longwinded way of saying that rhythm guitar is the type of guitar music that is played along with a song (either just a singer or with a whole band). 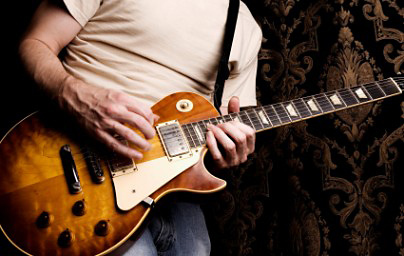 The different musical styles have different styles of rhythm guitar that is usually played along with them. From wikipedia, "A lead guitar is a guitar part which plays melody lines, instrumental fill passages, and guitar solos within a song structure". Most people who are learning guitar start with rhythm guitar and then (if they are interested) move on to learning lead guitar. The electric guitar usually has a solid wood body, though there are "semi-acoustics" which are hollow, but much thinner than a true acoustic guitar. Electric guitars have pickups which pick up the sound from the strings, which then goes into an amplifier. The stings on an electric guitar are lighter than on a steel-string acoustic guitar, which means it will be easier on your fingers when you are learning. Electric guitars have lighter strings because the sound is amplified, so they don't need to be heavy enough to make sound all of their own like an acoustic guitar does. The lighter strings also allow you to bend them to a different note, which is a common technique in lead guitar playing. 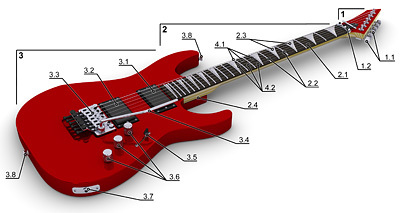 The picture below (taken from Wikipedia) shows the parts of a typical electric guitar. The only thing unusual about the guitar in the picture is that the machine heads (tuning pegs) point in the opposite direction to usual. This is known as a "reverse headstock" style of neck. The steel-string acoustic guitar is the one you see most often in contemporary music. That is, it is played by most acoustic players who don't play classical music. They come in several different shapes and sizes. One common shape (which is quite large) is the "Dreadnought", which is the shape most people think of when they think of an acoustic (non-classical) guitar. The body is hollow and made of wood. The hollow body amplifies the sound of the strings so that you can hear it without an amplifier, though many acoustic guitars also have pickups so that you can plug them in. The steel-string acoustic guitar is the hardest type of guitar on your fingers. This is important to know when you are beginning, since it takes a while for your fingers to toughen up. The strings are thicker than on an electric, because they need to be big enough to make the guitar's sound with no amplifier. You can't really bend the strings in the same way that you can on an electric, though they can be bent a little for some styles of playing (and when your fingers develop and strengthen). The classical guitar looks a lot like a steel-string acoustic guitar, except the strings are made of nylon rather than steel. Three of the strings look obviously nylon, while the other three look like they are steel (because they are wrapped with thin metal wire wound around them) — but the core of the string is actually made of nylon. Instead of bridge pins (like a steel-string acoustic guitar) to hold the non-tuning-peg end of the strings in place, the nylon strings of the classical guitar are simply tied on. If you buy a classical guitar, it is important to know that classical guitars are made for nylon strings. The nylon strings have a much lower tension than steel strings, and classical guitars are not made to handle the extra tension of steel strings. So don't ever put steel strings on a classical guitar, or you will probably destroy the guitar. The photo above from Wikipedia shows a classical guitar. Note the different style of headstock — you can actually see right through it. A classical guitar has a completely flat neck, while the other types of guitars have a neck that is slightly curved. 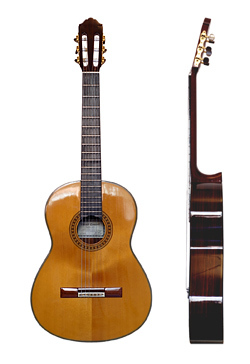 Classical guitars also usually have a wider neck than other guitars. Classical guitars can be good for beginners (even if you are not learning the classical style of playing) because the strings are much softer to the touch, so you are much less likely to get blisters on your fingers. However the sound is quite different (much more mellow) than a steel-string guitar. Here are some of the open position chord shapes which most beginners learn (once they know enough to know how to learn them). Don't try to learn all of these at once. If you are up to learning these kinds of chords, start with just two or three, such as G, C, and D, or A, E, and D, which can be used to play many whole songs. (Later I will post some easy songs that you can play with just a few chords). If you are new to these kinds of diagrams, the lines going up and down represent the guitar strings and the horizontal lines are the frets. The black dots mean you put a finger on that position. A circle at the top of the diagram means you play that string "open", without pressing it down at any fret. If there is no circle or dot on a string, don't play that string at all for that chord. If you live in the Penrith and Lower Blue Mountains area and would like more information on guitar lessons at Blaxland (in the Lower Blue Mountains) please contact me on 0414 663 060 or use the contact form on this website.